Red Wings Abandoning “Hockeytown” Moniker? With the annual Red Wings Fantasy Camp taking place at Little Caesars Arena today, the world got its first look at the arena’s ice for the 2018-19 season – and it was missing something. 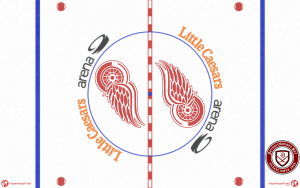 The “Hockeytown” logo that had adorned the center ice circle for the arena’s inaugural campaign (and since the mid-1990s at Joe Louis Arena) was replaced by the team’s standard Winged Wheel logo. Does this mean that Detroit is no longer Hockeytown? Well, Hockeytown Cafe remains just a few blocks from the arena. Hockeytown Authentics in Troy is still open. However, the “Hockeytown” trademark itself is listed as “cancelled” in the US Patent and Trademark Office’s Trademark Electronic Search System (TESS). Additionally, the most recent document recorded as part of the “Hockeytown” trademark filing is a courtesy reminder from the USPTO to the Red Wings about required filings that had not been made, dated June 23, 2017. WARNING: Your trademark registration will be CANCELLED and will EXPIRE if you do not file the required documents below during the specified statutory time periods. The above-identified registration registered on Jun 23, 1998. Therefore, the owner of the registration must file a Declaration of Use and/or Excusable Nonuse and an Application for Renewal under §§8 and 9 of the Trademark Act anytime between now and Jun 25, 2018. For an additional fee, the owner may file the documents within the six-month grace period that ends on Dec 24, 2018. See 15 U.S.C. §§1058, 1059. The current fee for a combined filing under §§8 and 9 is $425 per class if the filing is made via the Trademark Electronic Application System (“TEAS”) and $725 per class if the filing is made on paper, and the additional fee for filing during the six-month grace period is $200 per class if the filing is made via TEAS and $400 per class if the filing is made on paper. 37 C.F.R. §2.6. A “cancelled” trademark is not the same as one classified as “dead,” though it would seem to be a sign that the Red Wings are – at the very least – scaling back their use of the mark. The Detroit News and Free Press initially reached out to the Red Wings regarding the change at center ice and did not receive a response. A prepared statement was later released. At center ice, we will debut a fresh, new look: the Winged Wheel, one of the most iconic logos in professional sports, will be prominently featured. Also, in the coming days, several new initiatives that celebrate the fans and passion of Hockeytown are scheduled to be announced. In the storefront at Fanatics.com, the official supplier of NHL merchandise, only two items were returned by a search for “Hockeytown” – both discounted. It’s worth noting that center ice at the team’s training facility still featured the Hockeytown logo as of Thursday. Additionally, the team’s statement used the word “Hockeytown” even while confirming that the logo would no longer be in place at center ice. 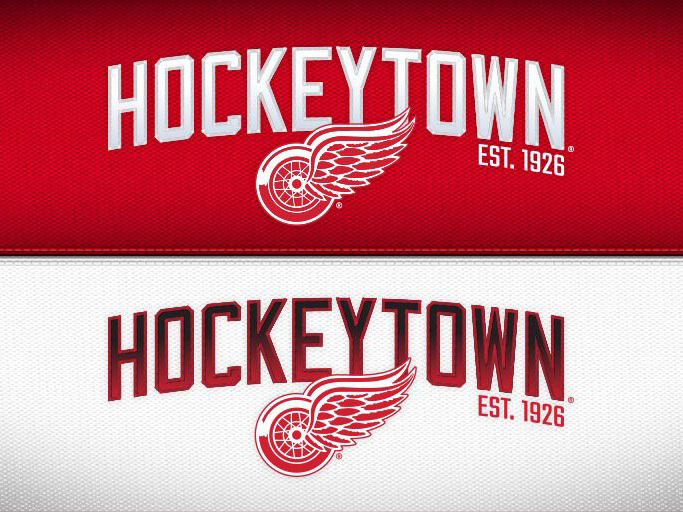 Personally, I would be fine with the Hockeytown name being abandoned. I’ve written previously about disliking the name and the logo. That said, I’d prefer to see the team go back to a pair of Winged Wheels on either side of center ice rather than one giant logo filling the faceoff circle. Author Clark RasmussenPosted on August 24, 2018 August 25, 2018 Categories Blog Post, Misconduct4 Comments on Red Wings Abandoning “Hockeytown” Moniker?